PCs have become incredibly diverse in recent years: there are now Intel NUC mini-PCs (for a living room), all-in-one PCs, powerful tablet computers, hybrid laptops with 360-degree tilting displays, incredibly thin and lightweight ultrabooks, and amazingly high-performance gaming laptops. However, none of these computers can be called a “real PC” – a computer that can easily be repaired and adapted to ever-evolving hardware and software constraints. While the tendency in recent years has been to replace desktop PCs with laptops, PC manufacturers are still as active and innovative as ever in the development of desktop gaming PCs. Major manufacturers, such as Dell, Asus, Acer, MSI, Lenovo, and HP offer gaming PCs with a “warlike” appearance that are often stuffed full of LEDs. These gaming PCs are well-suited to receiving upgrades and optimizations (several graphics cards, liquid cooling, etc.). The gaming PC market is also driven by specialized retailers (Amazon, for example) as well as computer assembly companies such as Newegg, BestBuy. In addition to distributing PCs produced by major manufacturers, these companies offer PCs assembled from the individual hardware components that can be purchased by anybody. These assembled PCs are usually less expensive than those offered by PC manufacturers, but they are also less original in terms of their design. In this article, we will focus exclusively on PCs offered by major manufacturers, which usually offer innovative features, such as an interesting case design. There is a direct relationship between how much you are willing to spend on your PC and how you intend to use it. For example, you can forget about playing the latest games in 4K on a PC retailing for 400 dollars. When it comes to choosing a PC, you will find defining your needs as useful as defining your budget. 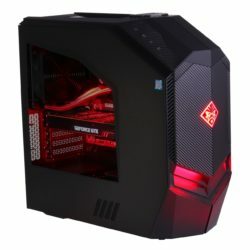 Currently, the minimum you can expect to pay for a gaming PC is between 500 and 600$. 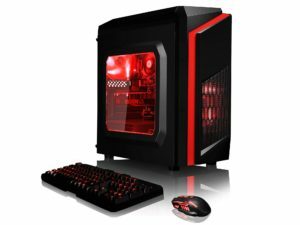 Depending on how well they are equipped and how original their case design is, beyond this threshold, gaming PCs can be categorized into several different price ranges. In this guide, we have only taken into consideration non-promotional prices due to the unpredictable nature of promotions which can start and end at any time. That being said, it is always a good idea to regularly consult the promotions offered on specialized sites; these promotions can allow you to save money and acquire better gear than your initial budget would otherwise have allowed for. 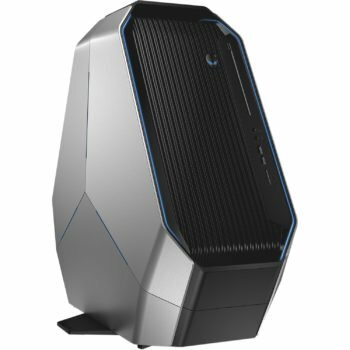 Gaming PCs in the 500 to 800 dollars price range will be good enough for performing daily tasks (reading e-mails, surfing the web, sorting family photos, downloading and watching movies and TV series). These computers can also be used to play undemanding games (games that are a few years old) or to play the latest games with drastically lowered graphics settings (in order to ensure a decent framerate – around 30 frames per second) in Full HD (1920 x 1080 pixels). The GeForce GTX 1050 represents the minimum recommended graphics card for gaming at the moment. You should also keep in mind that SSDs are capable of revolutionizing the user experience by allowing for much faster loading times. Unfortunately, this type of disk is something of a rarity on entry-level gaming PCs. Computers in this price range most often feature an Intel Core i5, or an AMD Ryzen 3 or 5 processor and usually come with a minimum of 8 GB of RAM. 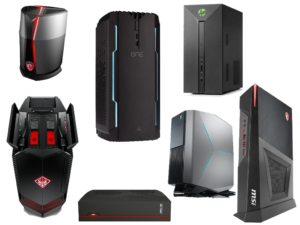 There are a quite a number entry-level gaming PCs being marketed by major manufacturers, such as the HP Pavilion Power, the HP Pavilion Gaming, the Lenovo Legion Y520 or the Acer Nitro N50. Generally speaking, this type of PC has a very sober looking case. 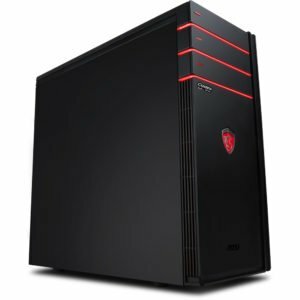 The 800 to 1300-euro price range is the domain of mid-level gaming computers. PCs in this range are slightly more sophisticated and feature graphics performance that is better suited to playing games in Full HD. This can be explained by their use of a GeForce GTX 1050 Ti or GTX 1060 graphics card. 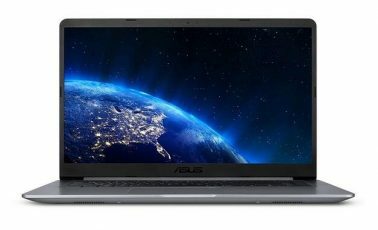 PCs in this price range are also more commonly equipped with an SSD and usually feature 8 or 16 GB of RAM; they also predominantly employ an Intel Core i5 processor. Some PCs in this price range, like the MSI Trident 3, the HP Omen 880 or the Asus GL12, already feature a more original case design. 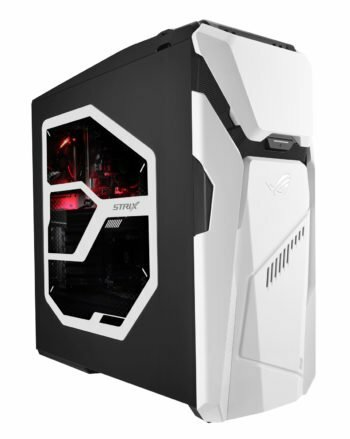 Between 1300 and 1600 dollars, you start to see PCs (such as the Asus GL21 or the Acer Predator Orion 5000) with a case featuring a typical “gamer” style design. Depending on the particular PC, it will feature an Intel Core i5 or i7 processor, 8 or 16 GB of RAM, and, more often than not, a GeForce GTX 1060 graphics card. In the 1600 to 2000 dollars price range, gaming PCs systematically exploit an Intel Core i7 processor. The preferred graphics card for PCs in this price range is the GeForce GTX 1070 or GTX 1070 Ti which allows for gaming on a QHD monitor (2560 x 1440 pixels). Some models at the top of this range sometimes feature a GTX 1080 graphics card. 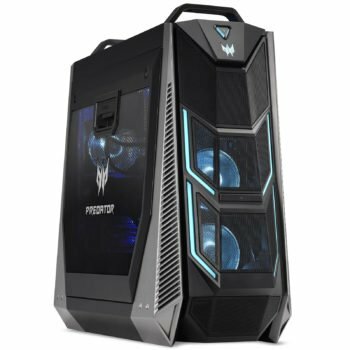 In the 2000 to 3000 dollars price range, gaming PCs – such as the HP Omen 900, the Acer Predator Orion 9000, the MSI Aegis Ti3 or the Dell Alienware Area-51 – become quite extravagant in their outward appearance. While the GeForce GTX 1080 and 1080 Ti graphics cards prevail in this price range, some gaming PCs feature a dual GeForce GTX 1070 graphics card setup. 2016 marked the arrival of the first VR headsets, but the end of 2017 marked their widespread adoption. While the first Oculus Rift and HTC Vive are currently dropping in price, it is the introduction of a new breed of headsets called “Windows Mixed Reality” that is sure to be a game-changer. Lenovo, Dell, HP, and Acer will all be offering these headsets which have been specially designed for use with Windows 10. In addition to their affordable price, they distinguish themselves by their slightly lower performance requirements and simplified installation: it is no longer necessary to place cameras or sensors in the 4 corners of your room since the headset has built-in sensors to automatically track your position in space. These headsets will also come with new motion controllers – one for each hand – to simplify interaction with 3D environments. If acquiring such a headset is one of your motivations for modernizing your computer’s hardware, you should remember that these headsets require a certain level of performance to function correctly. To make things easier for consumers, most manufacturers now include a “VR READY” logo on gaming PCs that meet these minimum requirements (those required for the HTC Vive and Oculus Rift). Some computers are also labeled “Windows Mixed Reality” or “Windows Mixed Reality Ultra“. Brand name PC or assembled PC? When buying a computer, a question often arises: should you opt for a brand name PC (HP, Acer, Lenovo, Dell, etc. ), marketed via a manufacturer’s website or the website of a major distributor (Amazon, Newegg, BestBuy), or should you opt for the type of assembled PC found on specialized sites or in a neighborhood store? Both options have their pros and cons. Most of the time, a brand name is the guarantee of good after-sales service: the slightest problem is usually solved quickly and efficiently. 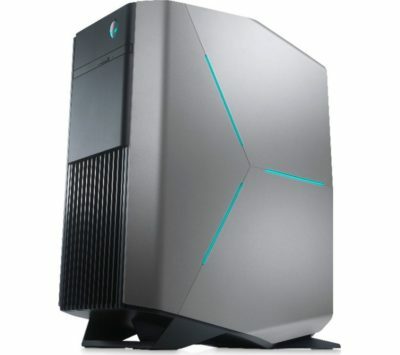 Furthermore, brand name PCs often feature an innovative case design (Alienware has often distinguished itself in this area) that may offer features not found on most other cases on the market (hot-swappable storage bay, for example). Furthermore, these cases are usually specifically designed to optimize the flow of air around the PC’s internal components (independent testing is still valuable for verifying the effectiveness of these designs). The main downside of gaming PCs marketed by major manufacturers is that they are quite often polluted by trash software (also called crapware or bloatware): worthless gadgets and games, paid antivirus software in its trial version, Microsoft’s Office suite in a one-month limited version, demos for the manufacturer’s paid services… These applications take up a lot of storage space, unnecessarily occupy the computer’s memory and, in the end, can considerably slow down the PC’s performance. Not to mention that some of them will harass you every day to acquire a paid version of the software. This detestable practice is so widespread that Microsoft now offers a Windows 10 utility that allows you, in one click, to reinstall your system without all this unwanted software: Refresh Windows Tool. Also note that PC assembly companies frequently offer “bare bones” commercial configurations (understand by this: without an operating system). This is useful if you only plan on installing Linux (which will somewhat lower your computer’s cost). If, on the other hand, you wish to install Windows 10 (if only to be able to play games), it will be necessary to add the cost of the license to that of your PC. In general, it is better to opt directly for a computer shipped with Windows since it will be cheaper than purchasing a license separately. It should also be noted that, unlike manufactured PCs, assembled computers sometimes come without a keyboard or mouse! This means that you will need to factor in the purchase price of these essential accessories (unless you are already equipped with these peripheral devices). When all is said and done, there is something reassuring about purchasing a PC from a reputable manufacturer if you are not very knowledgeable about computers and don’t know anyone who is. Buying a PC from a major manufacturer is also investing in peace of mind. But assembly companies are now offering a wider choice of hardware configurations, which, unfortunately, do not always come with a pre-installed OS. Processor: Intel or AMD, choose your side! Three-quarters of the PCs on the market these days use the Intel platform: most of the computers being sold nowadays have a motherboard with an Intel chipset, on which is installed an Intel processor. While it is still possible to find PCs using 7th generation (Kaby Lake) Intel Core i3/i5/i7 chips, their systematic replacement by 8th generation (codename Coffee Lake) processors is underway. 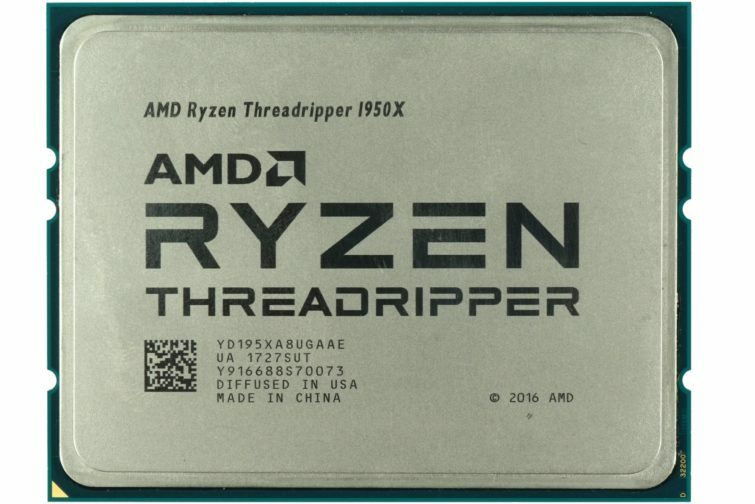 The arrival of AMD’s Ryzen 3, Ryzen 5 and Ryzen 7 processors is giving Intel a run for its money and is reviving healthy competition, mainly in the entry-level and high-end segments of the gaming PC market. When it comes to gaming, the choice of a graphics card is obviously an important one. The more powerful (and therefore expensive) it is, the more spectacular the visual effects and the greater the fluidity of the animations it will be able to deliver. However, ask yourself: do you plan on using one or two monitors? Are you content to play in Full HD (1,920 x 1,080 pixels) or do you plan to switch to QHD (2,560 x 1440 pixels) or 4K (3840 x 2160 pixels)? Finally, will you be satisfied with a 60 Hz refresh rate or do you swear by 120 Hz and up? At the entry level, the NVidia Geforce GTX 1050 GPU is ubiquitous. There are, however, some PCs using an AMD Radeon RX 560 GPU. Similarly, mid-level PCs primarily employ GeForce GTX 1050 Ti and 1060 GPUs. Nevertheless, Alienware offers an Aurora product line that makes use of an AMD Radeon RX 570, RX 580 or RX Vega 64 graphics card. In high-end hardware configurations, costing between 1600 and 4000$ (or more! ), Nvidia chips (GeForce GTX 1070, 1070 Ti, 1080 and 1080 Ti – standalone or in a dual setup) are the most prevalent. 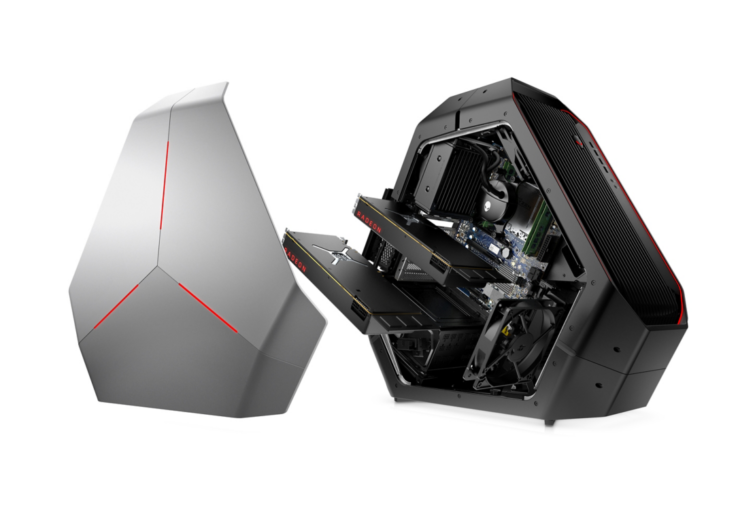 Only Alienware employs AMD GPUs, in its Area-51 ThreadRipper range of products, which can be equipped with one to three RX 570X or RX 580X graphics cards (or, alternatively, a dual Radeon RX Vega 64 graphics card setup). In conclusion, when you opt for a mid-level or high-end PC, your selection (as far as onboard graphics are concerned) will mainly be based on your needs in terms of both game performance (if you are a gamer) and the number of displays you intend to use (if you mainly do advanced office work, 3D creation or development). For a PC intended primarily for gaming, the recommended minimum amount of RAM is currently 8 GB. If – in addition to gaming – you regularly and simultaneously use several applications that handle a large amount of data (graphics editing, video editing, etc. ), 16 or 32 GB of RAM will allow for greater flexibility and better overall performance. Recently, family-oriented PCs have begun to incorporate 32 GB or 64 GB of RAM – amounts that are not very useful for gaming, but recommended for complex video editing. This amount of memory is also useful if your activities (developer, tester, geek, IT manager) lead you to regularly launch multiple virtual machines on your computer. In any case, as the addition of a stick of RAM can be done in a matter of seconds, if you are on a tight budget, give preference to your computer’s GPU, CPU or SSD at the expense of its memory. You will always be able to expand your PC’s RAM at a later time if you are feeling too restricted. The access time and bit rate of a storage device are the parameters that have the greatest influence on user performance (Windows startup, game launch, etc. ); if you want your computer to be highly responsive, these elements should not be overlooked. In this respect, nothing beats an SSD – a component featured on all high-end and mid-level gaming PCs. While some entry-level PCs feature an SSD, others prefer to use an SSHD (a hybrid hard drive incorporating a large flash memory cache) to achieve a compromise between the performance gain afforded by SSDs and the storage capacity of conventional hard disks (HDD). Another solution to boost the performance of a conventional hard disk is Intel Optane memory. It provides a memory cache that transforms a simple hard disk into a hybrid hard disk. A conventional hard disk (HDD) remains essential for mass storage, especially for photos and videos but also for games (which are becoming more and more demanding in terms of storage space). Indeed, the standard SSD featured on most entry-level gaming PCs is usually limited to 128 GB, which is enough to accommodate Windows and a few games. Particularly bulky multimedia files (photos, videos, HD audio tracks), are, in turn, usually stored on a conventional hard disk (internal or external). For computers sold with a hard disk, ensure that its rotation speed is 7200 revolutions per minute in order to benefit from optimal performance. As for a hard disk’s capacity (500 GB, 1 TB, 2 TB, etc. ), the more the better. However, capacity is no longer a very important consideration since an internal hard disk can easily be added to your case at any time; alternatively, an external hard disk can be connected via USB 3.0. The one component that most sets apart a slow PC from a responsive one is an SSD – at least as far as user experience is concerned! Whether you opt for the least powerful PC or the most powerful computer on the market, do not hesitate to add an SSD and install your operating system of it (if your PC does not come pre-configured with an OS). Other PC components (DVD or Blu-ray reader/writer, SD memory card reader, Bluetooth controller, WiFi, sound card…) should not be essential considerations at the moment of purchasing a PC since they can be added later by means of very inexpensive USB devices. It is best to focus your attention on the key components mentioned above in order to obtain the best possible fundamental hardware. DVD burners have become something of an anachronism, and while some users may still want to have one of these devices, they are likely to disappear from the market in the coming months. Another example: built-in WiFi is not necessary if your PC is close enough to your internet box that you are able to connect to it via Ethernet. And, if this is not the case, and a wireless connection is required, an 802.11n USB key only costs around ten euros! A Bluetooth adapter – increasingly important for interaction with smartphones, sports bracelets and of course wireless headsets – costs around the same as a WiFi adapter. Looking at a computer’s hardware components is a good way to differentiate between PCs. To get the most for your money, do not hesitate to opt for a PC without a DVD reader/writer, SD reader, WiFi or Bluetooth because it will always be possible to add whatever you need via inexpensive USB peripherals. From the previous paragraph, you will probably have noticed how important USB ports have become. The more you have, the better, because your mouse, keyboard, headset, smartphone, and external backup disk will all use this type of port – as will a WiFi or Bluetooth adapter (if your motherboard is not equipped with this connectivity). Don’t forget about virtual reality helmets either! The Oculus Rift alone requires four USB ports (3 USB 3.0 ports and one USB 2.0 port). USB 3.0 ports (or USB 3.1 Gen 1, often recognizable by their blue color) are now essential for connecting external drives (with transfer rates 10 times faster than those of USB 2.0), but also VR headsets. USB 3.1 ports (USB 3.1 Gen. 2, normally turquoise) are an evolution of the USB 3.0 port offering transfer rates of up to 10 Gbit/s; they can also carry HDMI or DisplayPort signals. USB Type-C ports are USB 3.1 ports (Gen. 1 or Gen. 2) with a new reversible connector (not compatible with older USB connectors). Note that some USB ports are red in color, designating ports (most often USB 3.x) carrying a power supply that can be used even when your computer is off to recharge your devices (smartphone, smartwatch, etc.). As we mentioned in the introduction, gaming PCs now come in a greater diversity of shapes and sizes than ever before. In addition to purely aesthetic considerations (which are a matter of personal preference), you will also want to consider where you will be placing your PC. If you intend to place it on your desktop, opt for a compact mini-tower. Large towers, which are more suitable for use as gaming PCs because of their ability to accommodate multiple graphics cards, will most often reside under a desk. Beyond the warlike or futuristic outward appearance of your gaming PC, you should pay particular attention to the internal design of its case. It is important to be able to easily remove the side walls of a computer case in order to safely intervene on all of the computer’s internal components (this is especially true for gamers interested in being able to replace their graphics card, hard disk or processor with ease). Furthermore, a PC’s cooling system and ventilation should be optimized for maximum efficiency and discretion (a liquid cooling system is used by the most advanced computers). This is because a computer’s processor and graphics card can reach very high temperatures after several hours of gaming if they are not properly cooled (which can result in malfunctions). The more a computer’s hardware components heat up, the quicker and more incessantly its fans will need to turn; this can generate a lot of noise if they are not optimized for silent operation. The choice of a PC can, of course, be made on the basis of aesthetic considerations, on the presence of easily accessible front ports, and on the use of LED lighting to customize its look. But you should not neglect the accessibility of your computer’s internal components, the quality of its cooling system or its quietness – all elements directly related to the design quality of a computer’s case. 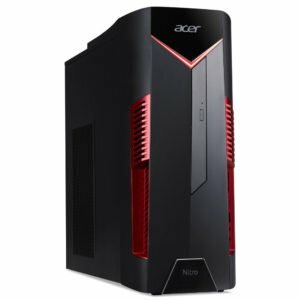 In addition to its gaming laptops, Acer offers a line of desktop gaming PCs, among which can be found the Aspire GX, Aspire TC, and Aspire XC (entry-level to mid-range models). These computers put the emphasis on the quality of their internal components over the aesthetic appeal of their case. Acer’s Predator PCs, on the other hand, are designed for gamers who don’t want to have to choose between playing under the best possible conditions and having a PC with a highly original case design. These sober-looking PCs are more like average computers than fully-fledged gaming PCs. However, retailing for around 600$, their hardware is sufficiently powerful for playing lightweight games: an Intel Core i5/i7 or AMD Ryzen 5/7 processor and a GeForce GTX 1050/1060 or Radeon RX 480 graphics card. However, the Aspire GX’s front-panel connectivity is rather limited (1 x USB type C port, 1 x USB 3 port, an SD card reader, and headphone/microphone jacks). With a GeForce GTX 1050 graphics card and a Ryzen 5 processor, the GX is capable of running more complex games (with decent performance but nothing more) at a framerate of around 30-40 frames per second in Full HD. However, it is possible to find versions of the Aspire GX equipped with a GeForce GTX 1070 graphics card for a reasonable price; these versions undoubtedly offer much better gaming performance. Launched a few months ago, the Acer Nitro N50 is very similar to the Aspire GX, although it has a slightly different case design (its connectors are situated at the bottom of its front panel). It features an eighth-generation Intel processor (i5-8400 or i7-8700 with 6 cores) and a GeForce GTX 1050/1060, or Radeon RX 580X graphics card. It has an innovative optional feature as well: a Qi wireless smartphone charger located on the top of its case. With this charger, simply place your smartphone in front of your PC in order to recharge its battery. Acer’s Predator Orion PCs have an aggressive look and feature a transparent side panel that allows you to see the computer’s internal components (illuminated by various lighting effects). Their (RGB) LED fans are also visible through their front panel which also features more extensive connectivity than that of the GX or the Nitro (three USB 3.0 ports, in particular). And, because the Orion 9000 has such a large case, it features a carrying handle and wheels to make it easier to move around. In addition, the Orion 5000 features a convenient headphone holder to prevent your headphones from cluttering up your desk. As far as their internal components are concerned, these high-end PCs feature a GeForce GTX 1080 or 1080 Ti graphics card, and the latest generation of Intel Core i5, i7 or even Core i9 processor (10 cores for the i9-7900X). 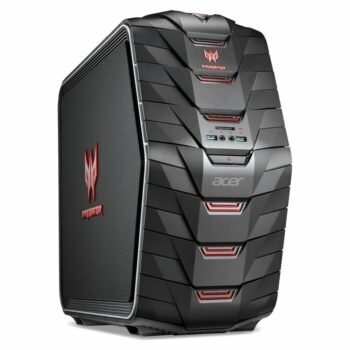 Acer’s Predator Orion PCs are highly upgradable, as they can accommodate up to 8 sticks of DDR4 RAM, 6 hard drives (4 x 2.5″ and 2 x 3.5″), and four graphics cards (Quad SLI 16X on the Orion 90000). Unsurprisingly, the Tom’s Hardware test of the Orion 9000 (US) highlighted its very high performance and excellent design but also its high price and large size. The Acer Predator G1, G3, and G6, which are still being sold, represent an older generation of Acer computers that are readily identifiable by their tank-tread-inspired design. While their lighting effects are quite discreet and they do not feature a transparent side panel, they do feature an innovative hot-swappable storage bay that makes it possible to swap out storage devices in a matter of seconds. Its two headphone holders will allow you to put your headphones down between gaming sessions. 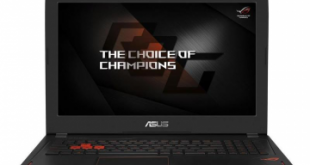 Asus offers a wide range of desktop gaming PCs spanning all possible budgets and styles, from its very affordable and rather conventional computers to its large and well-equipped Republic Of Gamers (ROG) PCs. These two entry-level gaming PCs have a case with a sober-looking, yet futuristic and angular design featuring a few discreet LEDs. They employ either an Intel processor and an Nvidia 1030/1050/1060 graphics card or an AMD Ryzen 5/7 processor and a Radeon RX480 or Nvidia graphics card. 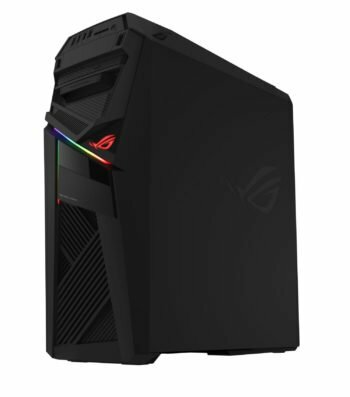 The mid-range Rog Strix GL12 has a clearly gamer-oriented design featuring two RGB LED strips on its front-panel as well as a transparent side panel (the Rog Strix GL12 is compatible with Aura Sync – Asus’ light management system offering many types of lighting effects: fixed, pulsating, rainbow, etc.). 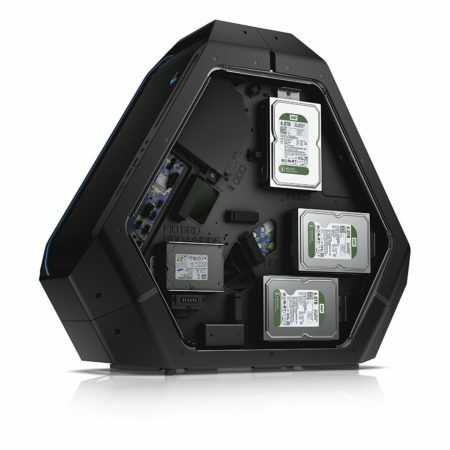 Its case is also equipped with a hot-swappable SSD bay – a very practical feature. The ROG Strix GD30CI’s front-panel (which resembles a Stormtrooper straight out of Star Wars!) can be reconfigured using various black or white elements. Its side panel has transparent openings that will allow you to admire its internal lighting effects. In addition, it is equipped with a headphone holder and a range of “lower-high-end” or “upper-mid-range” (depending on your perspective) hardware components: a GeForce GTX 1070 graphics card and a 7th generation Intel processor. Another practical feature of its design is its front-panel connectivity, which includes a USB 3.1 type C port with Quick Charge function. Its case can also accommodate up to 6 internal storage devices, including two M.2-format SSDs. Launched in the second quarter of 2018, this PC has a compact tower format (13 cm wide) – the downside of which is that it can only accommodate one PCIe x16 graphics card. However, it has a futuristic design, with, in particular, a foldable side panel to allow you to see its internal components and to allow air to pass over them for better cooling. Its front-panel is illuminated by RGB LED strips and features a hot-swappable SSD bay and three USB 3.1 ports (including 1 USB type C port). Launched at the end of 2016, this top-of-the-line model is still being sold. It features a very stylish, futuristic case that has a side panel with a transparent cut-out and an illuminated opening on its front panel that resembles an engine turbine. Its case, which features a button for overclocking the processor, can accommodate two graphics cards. The GT’s RGB lighting is compatible with ROG Aura (a system for coordinating lighting effects between Asus components). It also features a USB 3.1 Quick Charge port on its front panel (among other connectors). While our test of the ROG GT51 confirmed its efficiency, it also revealed a high noise level and a poorly controlled processor temperature. Corsair, a well-known manufacturer of hardware components launched its desktop PC for gamers in 2017 – it is minimalistic but highly effective. 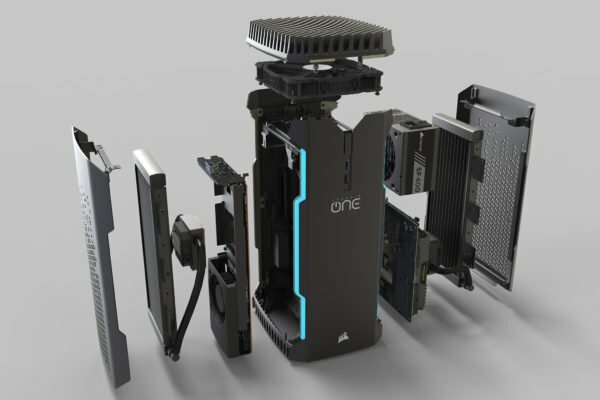 The Corsair One is a highly compact computer (20 x 17 x 38 cm) benefiting from a very well-conceived design – especially in terms of the optimization of its cooling system. Of course, most of its internal components are manufactured by Corsair. The Corsair One can accommodate two hard drives and an M.2 NVMe SSD; it also has two memory slots reserved for two DDR RAM sticks (operating at 2666 MHz). 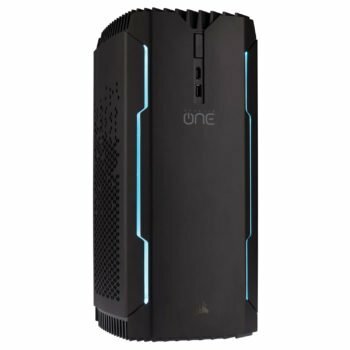 The Corsair One is marketed as a very quiet computer. 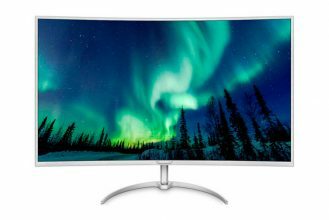 It has a simple yet modern design featuring two LED strips on its front-panel as well as a host of conventional connectors (among which can be found an HDMI output – convenient if you plan on using a virtual reality headset). A liquid cooling system (with two 240 mm radiators) regulates the temperature of its processor and graphics card – resulting in a perfectly controlled temperature and low decibel level. The only real problem with the Corsair One is its high price. However, since it is specially designed for gaming in 4K, its components are well worth the asking price: GeForce GTX 1080 or 1080 Ti graphics card, 16 or 32 GB of RAM, 2TB hard drive + 480 GB SSD and Intel Core i7-7700K or i7-8700K processor. Dell’s gaming PC offering is quite straightforward: you have the choice between a relatively inexpensive desktop PC with gamer-friendly components (the Inspiron Gaming); a PC for experienced gamers, with more powerful hardware and a case designed to meet specific needs such as liquid cooling (the Alienware Aurora); and a monster PC (in terms of its power and design) geared towards gamers for whom money is no object (the Area-51). This gamer-oriented Inspiron PC has a rather sober-looking case with a front-panel that seems to have been hacked at with a sword. Its components are pretty much entry-level to mid-range: 8th generation Intel Core i3, i5 or i7 processor, 8 or 16 GB of RAM, and a GeForce GTX 1050 or 1060 graphics card. Its hard drive is complemented by an SSD (except for on the least expensive versions of the Inspiron Gaming). The Aurora, while not very extravagant, looks more like a gaming PC than the Inspiron Gaming does, in particular, because of its side LED strips. It also has the advantage of being very easy to open (without a screwdriver), which facilitates the replacement of its hardware components. Furthermore, its components are more powerful than those found on the Inspiron Gaming (GeForce GTX 1070, 1080 or 1080 Ti, or even two GTX 1070/1080 Ti cards) – except for the least expensive versions of the Aurora, which feature a GeForce GTX 1050 Ti or a Radeon RX 560X graphics card. Many different storage solutions are also available. 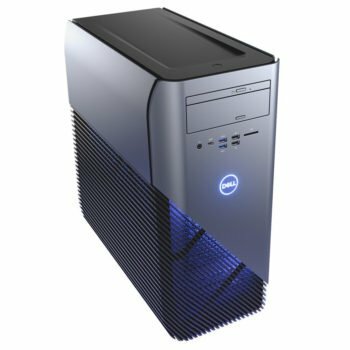 Dell even has a special edition of its Area-51 PC (named ThreadRipper) that can be configured with AMD components: Ryzen ThreadRipper 1900X, 1920X or 1950X processor and one or two Radeon RX Vega 64 graphics cards, or one to three Radeon RX570X/580X graphics cards. 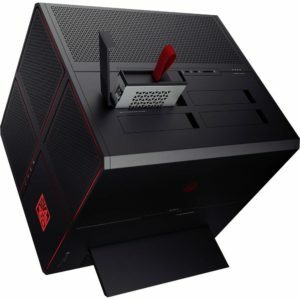 As with its laptops , HP offers two types of desktop PCs equipped with the kind of hardware gamers are looking for: the Pavilion Gaming and Pavilion Power series on the one hand, and the Omen on the other. These PCs are mainly characterized by their compact case (17 x 27 x 33 cm). The Pavilion Gaming is available in two formats: 690 and 790. They have a very sober-looking case design featuring a discreet strip of green LEDs. As far as hardware is concerned, entry-level models of these two PCs feature an Intel Core i5 or AMD Ryzen 3/5 processor. More expensive models can feature an Intel Core i7 processor and a GeForce GTX 1070 or even 1080 graphics card (versus a 1050, 1050 Ti or 1060 card for the lower-end models). If you are looking for a PC with a more aggressive look, the Omen 880 is a perfect choice. 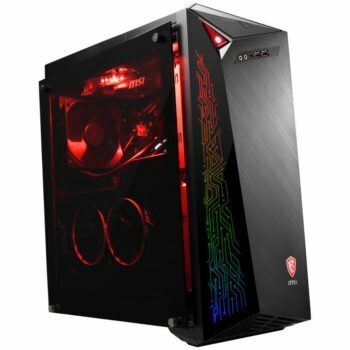 Its case has a clearly gamer-oriented design featuring a transparent side panel and an angular front-panel that is red in color. Two removable flaps cover receptacles for 3.5-inch hard drives. What’s more, the Omen 880’s case can be opened without a screwdriver and features a handle for easy transportation. The Omen 880 can accommodate two additional storage units. Its Intel Core i7 processor is most often complemented by a GeForce GTX 1070, 1080 or 1080 Ti graphics card. However, the least expensive versions employ a GeForce GTX 1050, 1050 Ti or 1060 graphics card. Overall, the Omen 880 is quite a decent gaming PC. 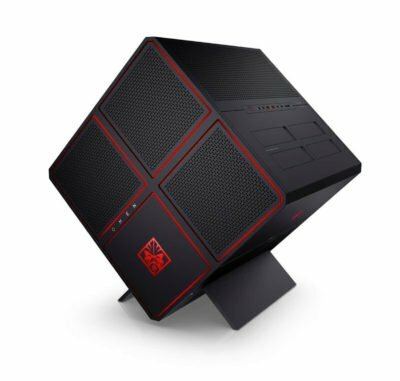 The Omen X is a very atypical PC that will impress your friends with its cubical case design – a design that would be very popular with the Borgs (“resistance is futile”) from Star Trek. This Omen X has just the right amount of aggressiveness built into its design and features a number of LED strips that produce dazzling RGB lighting effects. In addition, no fewer than four storage bays are accessible without the need to open the case and without the need for tools. Furthermore, its cooling system is quite sophisticated: a 120 mm liquid cooling system and three fans. It goes without saying that its internal components are of high quality; some versions (retailing for around 3000$) are sold with two GeForce GTX 1080 graphics cards; other versions (retailing for upwards of 6000$!) feature two GeForce GTX 1080 Ti graphics cards and a Core i9-7900X processor. It would be hard to talk about desktop gaming PCs without mentioning the mini Intel NUC Hades Canyon PC. This computer is perfect for creating a discreet setup in a living room or small bedroom. Indeed, despite only measuring 22 x 14 x 4 cm, for a weight of 1.4 Kg, its hardware is very comprehensive and efficient. 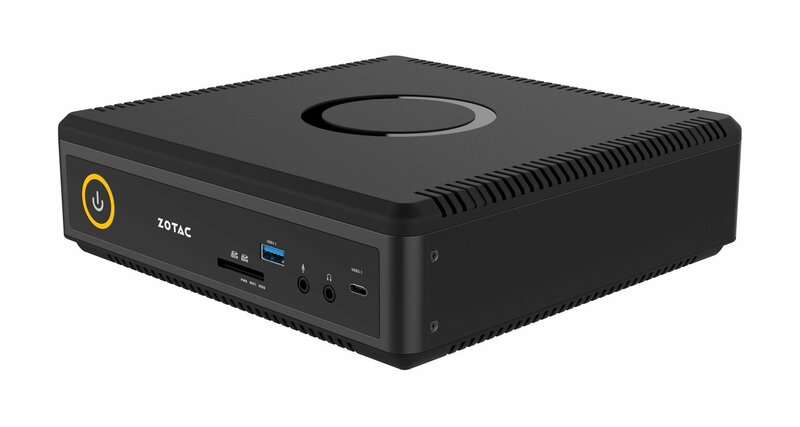 For example, the NUC8i7HVK incorporates an eighth-generation Kaby Lake G type Intel Core i7-8809G processor (4 cores at 3.1/4.2 GHz), and an AMD Radeon RX Vega M GH graphics card. The latter should allow you to play the majority of recent games in Full HD without any problems. All it takes to get this “barebones” PC up and running is adding one or two sticks of RAM (So-DIMM DDR4 2400 MHz) and up to two M.2-format SSDs (SATA or PCIe). This mini PC is equipped with all the essential connectivity; in fact, its connectivity even puts some large towers to shame: 5 USB 3.0 ports, 3 USB 3.1 ports (including two Thunderbolt 3 compatible C type ports), two HDMI connectors (including one on its front panel for VR), two mini DisplayPort connectors, headphone/microphone jacks and an SDXC memory card reader. 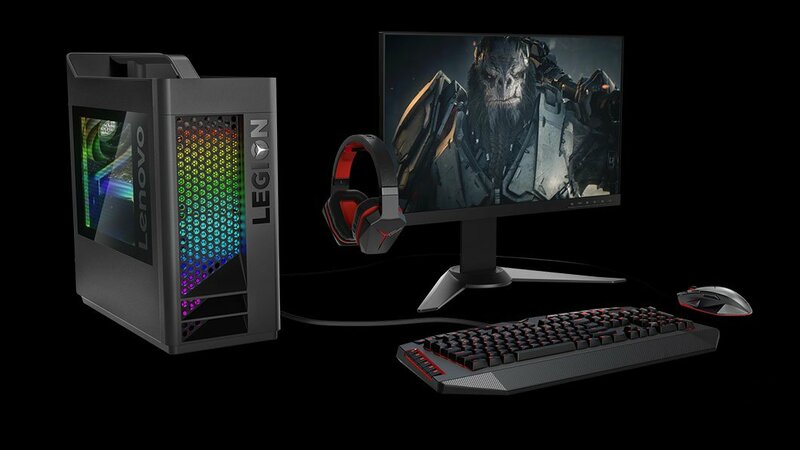 Lenovo desktop gaming PCs are divided into two groups: Legion Ys on one side (same nomenclature as their laptops), and Legion C & Ts (launched mid-2018) on the other. 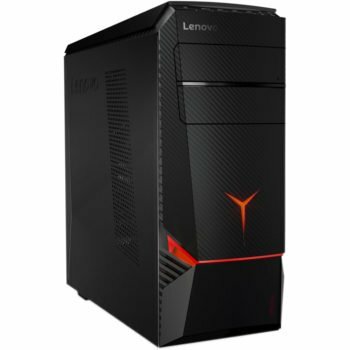 Legion Y desktop computers are available in three different versions: the Y520T, Y720T, and Y720 Cube. The first two models fall into the entry and mid-to-high-end categories. 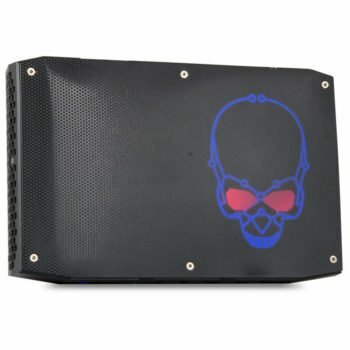 They have a rather sober-looking, but well-conceived case design (resembling a warrior robot’s head), with discreet red LEDs on their front panel, a transparent side panel and the bare minimum number of front-panel connectors (on the Y520T): 2 USB 3.0 ports and headphone/microphone jacks. The Y720T has two additional USB 2.0 ports as well as a memory card reader. The Y720T also distinguishes itself by its side panel which can easily be opened without tools. As far as hardware is concerned, the Y520T incorporates a GeForce GTX 1050 or 1060 graphics card (compared to a GeForce GTX 1070, at best, for the Y720). The Y720 Cube, as its name suggests, is a miniature cubical PC that also features a carrying handle. And, despite its small dimensions (39 x 31 x 25 cm), it can accommodate a range of components as comprehensive and efficient as the “normal” Legion Y720. 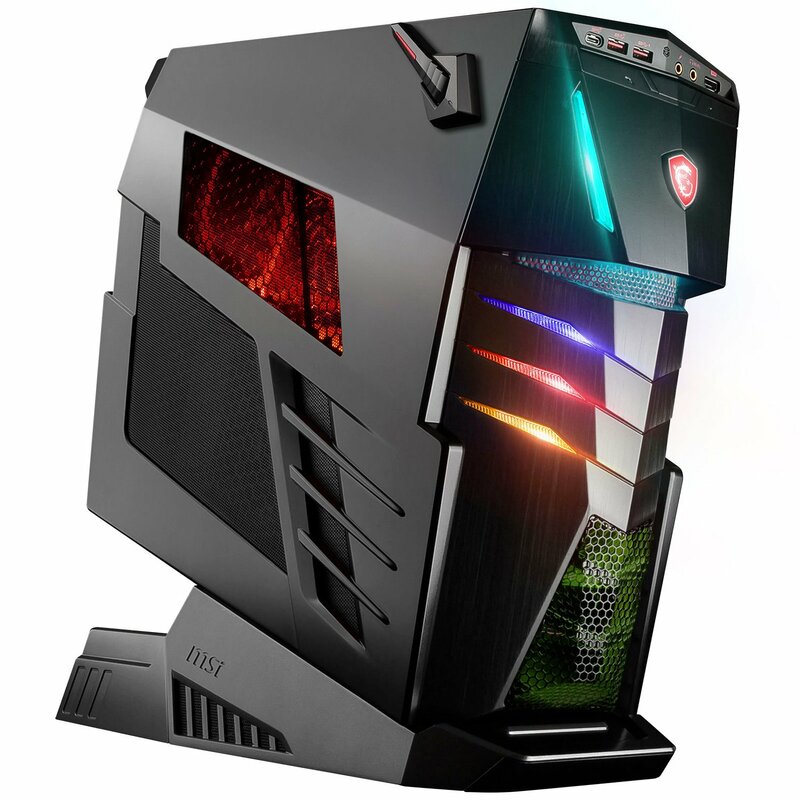 MSI is one of the most active players in the gaming world, as demonstrated by its gaming PC catalog, which features no fewer than six product lines – it has something to offer the gamer in each of us. Codex PCs put greater emphasis on the performance of their internal components than on the functionality of their case – which has a very basic design. They also feature a wide range of hardware components, which can include a GeForce GTx 1060 or 1070 Ti graphics card. 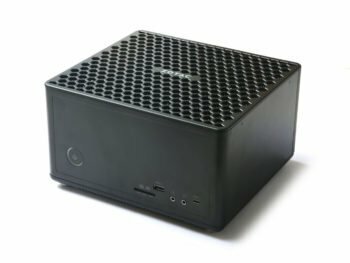 Nightblade PCs are large and more or less cubical mini PCs. The Nightblade 3 measures 23 x 35 x 48 cm, for a weight of 7.4 Kg (a handle allows it to be easily transported). Quite angular and illuminated by red LEDs, it has a clearly gamer-oriented design. Only slightly larger, the Nightblade MI3 is both efficient and silent – as demonstrated by our tests. Another PC with an innovative format, the Trident 3 resembles a large gaming console – like the Asus ROG Huracan or the Zotac MEK1. It only measures 35 x 25 x 10 cm and can be used in a horizontal or vertical configuration. The only (small) problem with this PC is that it is “limited” to a single hard drive and one M.2-format SSD. Despite featuring relatively high-performance hardware components (Core i7-7700 processor and GeForce GTX 1060 graphics card), its cooling system ensures a reasonable internal temperature and low decibel level. In its Vortex product line, Lenovo offers two distinct PCs, with two very different formats: the G25 and the G65. The Vortex G25 is very similar to the Trident 3 and can be placed both horizontally and vertically. And, despite its small size, it can accommodate 4 sticks of DDR4 RAM. Our testing of this PC highlights its good performance and the efficiency of its cooling system. As for the Vortex G65, it has an even more innovative format: cylindrical! Measuring 19 x 20 x 28 cm, its atypical format allows it to incorporate a very comprehensive range of hardware components: two graphics cards, four sticks of DDR4 RAM, and a storage system consisting of a hard drive and two M.2-format SSDs (which can be used in a RAID 0 configuration). Ultimately, our test of the G65 produced mixed results, especially as far as its noise level is concerned. The Infinite product line, and in particular its latest representative, the Infinite X, features a more traditional design: a tower type design with a transparent side panel and LEDs that illuminate the front and inside of the case. Its front-panel connectivity is very comprehensive (USB 3.0, USB 2.0, and USB 3.1 type C ports; an HDMI connector; and headphone and microphone jacks). Its performance is ensured by its mid to high-end components. For many years, Zotac has been best known for its graphics cards and its “barebones” mini PCs – Zboxes – of which the Zbox Magnus is one of the latest representatives. 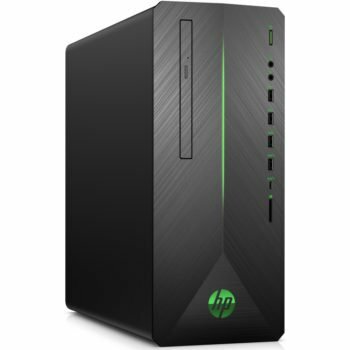 Its PCs feature hardware that is quite well suited to gaming. 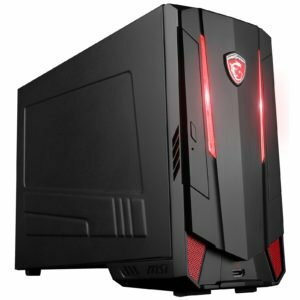 This manufacturer’s desktop gaming PC offering has recently been enriched by a (somewhat) more conventional PC: the MEK1. Available since the beginning of 2018, the Zbox Magnus comes in two different formats: the EN (the smaller of the two – 21 x 20 x 6 cm), and the EK/ER (twice as large – 22 x 20 x 13 cm). These PCs have the advantage of being able to incorporate high-performance components, up to an Intel Core i7 processor in conjunction with a GeForce GTX 1070 or 1080 graphics card. The difference between the Zbox EN and the EK, in addition to their respective formats, is the type of Intel processor used: a low-frequency, low-power model for the EK (Core i7-7700T, for example), compared to a “normal” processor for the Zbox EN (Core i7-7700 – faster but hotter). In addition, the Zbox EN employs an XMX format graphics card (so it can be replaced IF a replacement can be found…). These two Zbox PCs can accommodate a 2.5-inch-format hard drive as well as an M.2-format SSD. The Zbox Magnus, for its part, features an AMD Ryzen chip. Launched only a few months ago, the MEK1 is the first fully-fledged desktop gaming PC (comes fully equipped, unlike a “barebones” model). Resembling a large gaming console (41 x 41 x 12 cm), this computer (which is available in white or black) features LED strips that highlight the contours of its case. In terms of hardware, the MEK1 features a Kaby Lake Intel processor (Core i5-7400 or Core i7-7700), 16 GB of RAM, a 1TB hard drive, and a 240 GB SSD. Its graphics card is mid-range to top-of-the-line: GeForce GTX 1060 or 1070 Ti.